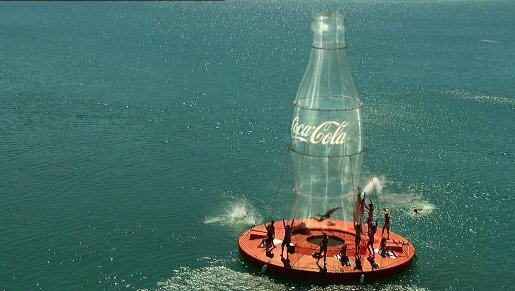 Coca Cola is celebrating Summer with Coca-Cola with a huge bottle fitted with an updraft designed to give swimmers the experience of a lifetime. The campaign, online at Summer Blast, includes outdoor and print advertising, “Uplift”, a feature television commercial, and an online game. Players launch themselves into the air by timing the power bar to get maximum height. They are then able to steer themselves as they fly through the air with the aim of staying in the air as long as possible and scoring maximum points. Players steer themselves through the air bouncing off hot air balloons or finding up currents to gain extra air time. Collecting bottle caps and landing in a designated target area give you extra points. Users can share the game on Facebook, as well as post their scores via Facebook Connect. The Bottle Opener campaign was developed at Ogilvy, Sydney by executive creative director Bruce Matchett, creative director Boris Garelja, creative group head Raj Rabindranath, copywriter Dom McCormack, art director Liam Hillier, agency producer Claire McDonald, and account manager Kura Tyerman. Filming was shot by director Josh Frizzell via 8 Commercials , Sydney, with director of photography Danny Ruhlmann. Music is “Open Happiness”, produced for an earlier Coca Cola commercial. It is a collaboration between Cee-Lo of Gnarls Barkley, Patrick Stump from Fall Out Boy, Brendon Urie from Panic at the Disco, Travis McCoy from Gym Class Heroes, Janelle Monae, and Polow Da Don and Butch Walker as producers. The Summer Blast game was designed at Boffswana.